The filming of the third movie in the Decotora’s Eagle series, titled Flower of Love Blossoming at Shimizu Port, has once again put the spotlight on an unusual pop phenomenon known as Decotora. 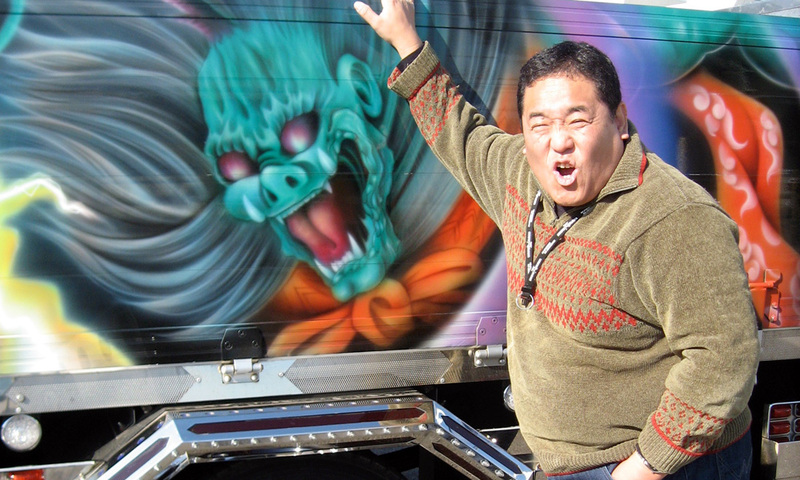 Decotoras are decorated trucks that first appeared on Japan’s roads about 30 years ago and have been the pride and joy of their drivers ever since and for some others they represent one of the strangest and coolest sub-cultural encounters in Japan. Trucks with protruding shiny steel front bumpers, colorful dashboard sun guards including high quality sound and light displays and airbrushed paintings covering every inch of the truck are the signs of a true Decotora. 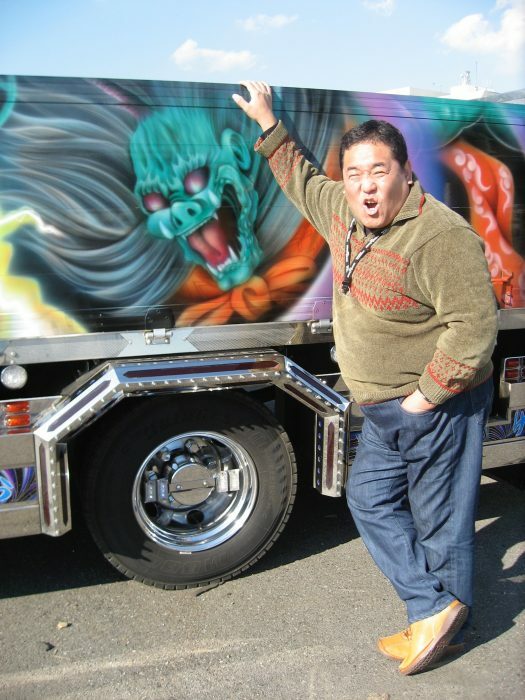 According to Takakuwa, there are about 300,000 to 400, 000 decotoras in Japan and his dream is to take some abroad to drive the positive and peaceful Japanese truckers’ message to all corners of the world. I visited one of the most respected artists, Sekiguchi Misao, whose dragons, gods and goddesses are synonymous with the touch of the otherworld among decotora connoisseurs. He works with his daughter at a lightning speed but prefers his art to speak for itself. “I paint symbols to protect the drivers from accidents and the recession! These are hard times, no doubt about it.” he said between brushstrokes. Money is scarce for another decotora lover, movie producer Sudo Tamegoro, a gentle and funny character, who in real life gets up at 5 am to bake bread till about 10 am, then runs around arranging the shooting schedule, begs money from sponsors and between meetings, even thinks of his tuna business. He is a jack-of-all-trades and the movie’s main character, Shuichiro is based on Sudo’s personality. Both men have the type of reassuring control that attracts everyone to them. In the Decotora movie, Shuichiro, played by the cool and very talented Aikawa Show, prefers to listen to not only what is said but what is not pronounced and he possesses the kind of vision that penetrates through the person just like his lit-up truck opens a tunnel of light in the blackened countryside. “He’s up for anything as long as it is a good deed. He is gentle and passionate, a real edokko and I love him! Director Katsuki Hideyuki really helped me create his character.“ says Aikawa. Shuichiro, the ultimate folk hero, is a perfect straight-up man and a younger and more handsome version of the super-popular Tora san. The first decotora movie, the 1975 Truck yaro! was based on Miyazaki Yasuo, a truly amazing character with a thin moustache, a big smile and polite manners.. ”Oh, it could have been any of my buddies, they are all more interesting than me! I just helped out with the script, that is all.“ he says with his trademark nonchalance but according to Takakuwa, he was already a legend among decotoras and this is why the movie was based on him. “Decotora movies are filled with average people making mistakes and trying to fix their lives. In this cycle of give and take even if we are dealt a bad hand, we can still survive by relying on the kindness of others. “says Sudo producer. It is exactly this philosophy that decotora drivers believe in and the Decotora movie offers a wonderful chance to peek into this peaceful and cool side of Japanese culture.